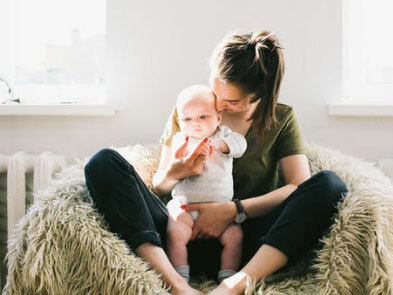 "Adjusting to parenthood is tough going and it's natural for parents - both mums and dads - to feel overwhelmed by their new normal", explains Cheryl Fingleson. "But when the baby blues last longer than a few weeks or so, it's important to consider whether post-natal depression or anxiety has set in. PND develops between one month and a year after having a baby and affects around one in seven women and 5% of new dads." Friends are often the first to notice when something's wrong. Here are some telltale signs to look out for if you're worried someone you know is struggling. 1. Withdrawing from contact and within social situations. People with PND often describe feeling as though they're in a bubble and feeling removed or separate from other people, even in company. Your friend might not be returning phone-calls or seem reluctant to meet up or socialise. 2. Tearfulness, irritability or sadness. Your friend might feel overwhelmed by things that never used to bother her. She might cry frequently or seem sad and upset. Alternatively she might appear emotionless and flat. 3. Anxiety. Your friend might feel intense or fleeting feelings of panic and worry. She might appear overly anxious about her baby's health, safety or behaviour, events, people or places. 4. Change in appetite. Has your friend lost a lot of weight? Has her appetite changed - is she eating more or less than usual? 5. Is your friend always hyper-critical of herself and her abilities? Loss of confidence is common in early parenthood, but feeling constantly worthless and useless also takes hold in PND sufferers. 6. Women suffering from post-natal depression and anxiety often find themselves no longer enjoying or finding pleasure in things they used to. 7. Of course every parent suffers from exhaustion, but if your friend's tiredness levels seem excessive, or they're sleeping more or less than usual - despite what they're baby's doing - then this can be a warning sign. 8. Panic attacks. This can include having moments when your friend's heart races, has palpitations, breathlessness, shaking or feeling 'detached'. 9. Does your friend fear being alone with her baby? Does she say or feel she's not the best person to look after her baby? These feelings of inadequacy can escalate in some cases When a woman is suffering from post-natal psychosis she may become convinced she - or someone else - will harm her baby if left alone. 10. Inability to focus, remember or concentrate. Again, all signs of early parenthood, but if you sense your friend is suffering these to an extreme extent it could be a sign of depression which fogs the brain. 11. Risk taking behaviour. Is your friend drinking heavily or taking prescription or illegal drugs? She may be self-harming or hurting herself in other ways. All these are serious warning signs that something is wrong. - Talk to your friend. Open up the conversation so she knows you're available to confide in. - Text your friend - it will mean a lot that you're thinking of her. - Encourage your friend to seek help. - Provide emotional and practical support. - Drop off food, take her children or baby out for a bit to give her a break. - Take her out - a change of scenery can be an enormous comfort. Cheryl Fingleson is an internationally certified gentle sleep expert who can help identify signs of postpartum depression.